Actually they aren’t, so I thought [read more=”Read more” less=”Read less”]that a brief, not too detailed, explanation might be good here. 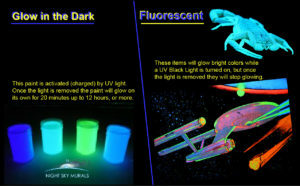 Glow in the dark paint products (Photo Luminescent Products) absorb light energy and stores it. Then when placed in a dark environment they will produce a glow called an after glow. The material that looks one way in normal light, then disappears when a room goes dark (doesn’t glow). The fluorescent paint glows a new, bright color when a UV light (black light) is turned on. There are paints that are made with fluorescing properties that create fun pictures. In normal, white light the picture looks one way, but turn on a black light and the picture takes on a new, different look. Black light posters were popular years ago and many rooms were adorned with these posters as well as black lights, not to mention secret stashes of drugs (not everyone had the drugs… just most). Zinc Sulfide: Zinc Sulfide is the type of pigment that has been used in many products for years. It is recognized by it’s quick activation rate (how fast it charges up), it’s bright glow, and the quick rate at which the glow fades away. One popular product that used this type of pigment was the cheap, plastic, stars that adorned many ceilings for years. This pigment was great because it didn’t need any specific light source to get the glow nice and bright. It usually lasted, in the case of the plastic stars, just long enough to outlast little Johnny as he drifted off to sleep. While there are various colors made from this pigment, the most popular color for this pigment is an ugly green. And, not only did it glow green, but it was also an ugly green in the light. Strontium Aluminate: Strontium Aluminate is a vastly superior phosphor to its predecessor, the previously mentioned copper-activated zinc sulfide. Glow paint made from Strontium Aluminate is about 10 times brighter, and glows about 10 times longer then its Zinc cousin. But for a price. It is also about 10 times more expensive. It is the pigment of choice of Night Sky Murals and used in their murals and stencil DIY kits. Many of todays glow in the dark toys also use this type of glow pigment. Normal, every day, glow in the dark pigments are NOT radioactive, and are basically inert and non toxic. However they are part of the silicate family and unless you have them specially coated they will react with water. Jeff, with Night Sky Murals, has mixed and painted with glow paints, made with the newer Strontium Aluminate for over 20 years. When he paints his murals, the paint gets all over him, in his hair, his eyes, mouth and all over his face and arms. He’d like to blame his balding head on the paint getting all over him, but it wouldn’t be true. He was thinning long before he started painting his murals. He has had no side effects from ingesting large quantities of this paint over the years. Results may vary… but you should be fine if you are around this paint. Fluorescent paint – Isn’t it the same as Glow in the Dark paint? UV reactive Products (things that fluoresce) will react to a range of Ultra Violet Light, and either will appear (become visible), as in Invisible Ink, or will produce a Glow Effect, as seen in UV Glow Paint… when a UV black light is turned on. If you have been to a night club or ever played with a black light, you would have seen UV Black Lights at work. The white clothing (shirts and shoe laces especially) on some individuals seemed to glow in the dark. Those items were reacting to the UV black lights. Nature also produces both organic and inorganic things that naturally Fluoresce. Examples are, Rocks, and Minerals… and scorpions. These organic and inorganic forms, naturally fluoresce, but their true beauty can not be seen in darkness, by the human eye unless we use a object like a UV Black Light. Many laundry soaps, both liquid and powder, have optical brighteners added. These additives help to make our white clothing appear whiter, and our colors look brighter. They also cause our clothes to fluoresce under a black light. UV Black Light Products need a UV black light source to fluoresce – (glow). Glow in the dark products use UV light to soak up energy, then will glow without the light. 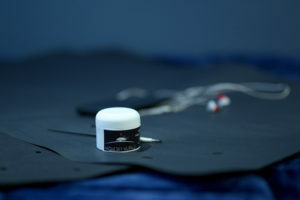 UV Black Light colors may be mixed together to create new colors, while glow in the dark products should not be mixed because the resulting mixture will produce inferior glow properties. A black light produces UVB light. Phosphors are what we actually see glowing under a black light. When they are exposed to radiation (like UVB), phosphors emit a visible light. So what they do is they pick up the UV rays that we normally can’t see, and make them visible. Which is why other things look dark while the phosphors glow in a dark room with a black light. Stenciling is any method of decorating that involves applying color shapes cut out of a sheet of impervious material. It is the art for everyone – a simple method of creating a unique and individuals patterns, whatever your creative ability. In our high-tech age, smooth polished surfaces and bland color, a stenciled pattern can excite the eye and lift the spirits. Stencilling produces an image or pattern by applying pigment to a surface over an intermediate object with designed gaps in it which create the pattern or image by only allowing the pigment to reach some parts of the surface. The stencil is both the resulting image or pattern and the intermediate object; the context in which stencil is used makes clear which meaning is intended. In practice, the (object) stencil is usually a thin sheet of material, such as paper, plastic, wood or metal, with letters or a design cut from it, used to produce the letters or design on an underlying surface by applying pigment through the cut-out holes in the material. A stencil is a piece of mylar plastic, metal, or Kraft paper in our case, with a design or picture cut out of it. When paint is applied to the cut out portions of it, the design is then transferred to your surface. Simple as that. You put this material on a wall, or ceiling, or whatever you are painting, and then paint through the cutout portions. When you then take the stencil away.. Voila! You have become a master painter and needed absolutely zero artistic talent to accomplish your stencil art. How cool is that? Night Sky Murals DIY stencils make everyone an instant artist – Yep, we have had so many people write and tell us that they have no artistic talent whatsoever and yet they painted an amazing night sky on their ceiling. On the first try! Anyone can stencil – We’ve had kids as young as 11 years old paint with our stencils, and seasoned citizens 65 years old use them too. And, of course, all ages in between. Everyone with great results. Well, there was that one guy. This guy orders a stencil kit from me (to paint a night sky for his girlfriend), opened the box, looked at the sheets of papers and thought I was selling a scam. He never even tried them. Just sent them back. Too bad… he could have painted a very cool mural of the night sky for his girlfriend. Stenciling is very inexpensive – Well, compared to having a night sky mural company come in and paint a mural for you, that is. But, compared to other star stencils that you can find on the Internet, ours are more expensive. More expensive, but a much better value for your money. Stenciling is an inexpensive way to redecorate – Wait! Didn’t I just mention that in the last comment? OK, fine, so more details are needed. Let’s say that you called in a company to come out and paint your night sky mural star ceiling for you. If your room is a 10 x 10 (3.05 x 3.05 sq. meters for some of you), you could expect to pay anywhere from $500 to $1500 for them to paint it. Less, if you’d like something slightly better than sticker stars, but that’s a fairly accurate range. Now, with one of our DIY stencil kits, you could paint multiple rooms for the one-time, very reasonable cost. You might need to get a little more paint when you paint multiple rooms, and Ibuprofen, but that’s it. The savings will just keep adding up. See, it truly is inexpensive! Update a piece of clothing or furniture – Nope, wrong type of stencils. Satisfaction – Find your inner artist – How cool to create your own universe. Family Activity – This would make a really fun, family activity. If you enjoy doing things together, then why not create an amazing outdoor environment, that all of you can enjoy, inside of your own home? Better than most companies – Already covered. Paint multiple rooms for same price – Covered. If you go crazy and decide to paint every room in your house then you might need to get a little more paint from us, but that isn’t a huge expense.